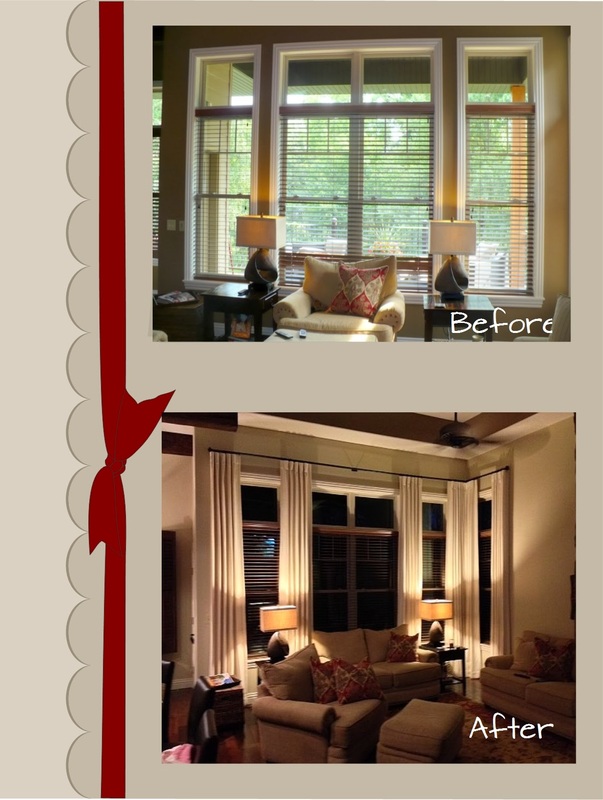 Madison Lane Interiors: Drapery pleats----who knew it mattered? Drapery pleats----who knew it mattered? I posted this before and after on Facebook last week, but didn't elaborate on any part of it. Besides figuring the placement of the panels between the windows and the corners, decisions were made on the type of lining, the hardware, and the type of pleats in the panels. If you look closely, you can see they are not "gathered pleats", but rather smooth folds of fabric, making a nice backdrop for the furniture and other decor. 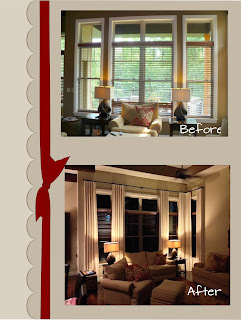 They basically clean up the sharp edges of the window frames and add a warmth to the room. This is part the "look" our client is wanting----not fussy, but not skimpy, either. Her home is decorated more in a "transitional" style, meaning it isn't contemporary although the lines in the furnishings are straighter than some of our more traditional pieces. If you want a formal, luxurious look, a silk, interlined, smocked drapery panel would fit the bill! For an everyday look, we still do the regular 3-prong pinch pleat panel----it's never a wrong choice. 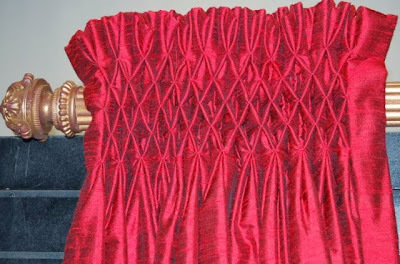 The amount of fabric inside the pleat and the spacing can be adjusted to fit into any home. Of course the more fabric inside the pleat and smaller spaces will make a very full panel. Just the opposite makes for a less full panel, but depending on the lining, can almost appear to be the same. Oh, so many choices.....how do you choose?? A pleat we see often in the shelter magazines (Traditional Home, Veranda, etc) is the Euro Pleat. We might even just refer to it as a pleat, pinched at the top! And that is the only difference between it and the regular Pinch Pleat. Just as we do many 2-prong pinch pleats, we do many 2-prong euro pleats. Still, the most common would be a 3-prong (or 3-finger) euro pleat. Look through your current decorating magazines and check-out the pleats----do you agree? The reasons for 2-prong vs 3-prong, euro vs regular pinched, goblet vs smocked, and cartridge vs grommets is as varied as each person needing window treatments. Besides the "look" you are wanting, the lining, the face fabric, and the price can all play a part in the decision making. Truly, our window treatments are CUSTOM, and you might hear more than an earful of information if you decide to purchase them from Madison Lane! We are more than happy to educate you further on your drapery needs. Come by and look through our hundreds of fabric books, along with all the information on pleats and drapery you ever thought you needed to know! It does matter!! !